Ex-seam is the standard way of sizing recumbents. It is a measurement of leg length that takes your hips into consideration. It will always be more than your in-seam length. The best way of telling if a recumbent model will fit you is to come in and sit on it. But if that isn’t possible you can check your ex-seam against the range that is (hopefully) supplied by the manufacturer. 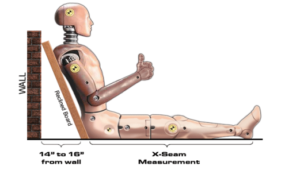 There is a basic method to measuring ex-seam, but it becomes complicated by few variables and manufacturers aren’t always clear about their assumptions. Sit on the floor with your back to the wall. Stretch your legs out in front of you and measure to your heel. That’s it. A similar method is to put a book upright against the wall and push your tailbone against that. Then measure from the book to your heel. 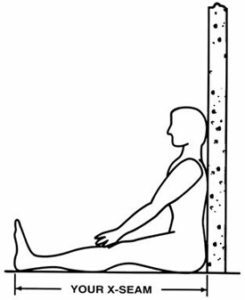 Another method, which Sun Seeker and TerraTrike use, has you leaning a board against the wall and leaning back against that. Measure from the board to your heel. You will get a shorter ex-seam measurement using this method than the standard method. It isn’t always clear if you should be wearing your cycling shoes or not. When in doubt, take the measurement with your preferred cycling shoes on. Taking an ex-seam measurement isn’t a really sure-fire way of knowing what frames you will fit, as you can see. If you take a measurement without help you will tend to get a too-big number (this has been our experience). In general, we find that people are more likely to come in thinking they are long enough in the legs for some model but find they are too short. We can reduce leg length on some models by using shorter crank arms or adding cushions to the seat.